Well I finally got to see and listen to the Middle T 's today. Gotta say they are awesome. Funny thing is the mid range driver lol had Axiom stamped on it. The tweeters had Bryston though. I said as I walked in the store omg you got a set of Bryston ,been wanting to see these speakers. I find the middle T's really interesting -- it's the one driver complement Axiom hasn't made recently. Ignore my previous comment - I was thinking about the Mini T, not the Middle T. D'oh !! BTW am I the only one who hadn't realized that Axiom already made an 8" woofer ? Two of them in fact ? I've been scratching my head for a while trying to figure out how the cool looking new woofer appeared so quickly... then just today I realized the EP400 has had a fairly awesome 8" woofer for years. Picture 1/2 way down has Axiom on the midrange basket. I wonder if this is by design/on purpose. James confirmed a while back "they have nothing to hide". I really want to hear them in 2.0. 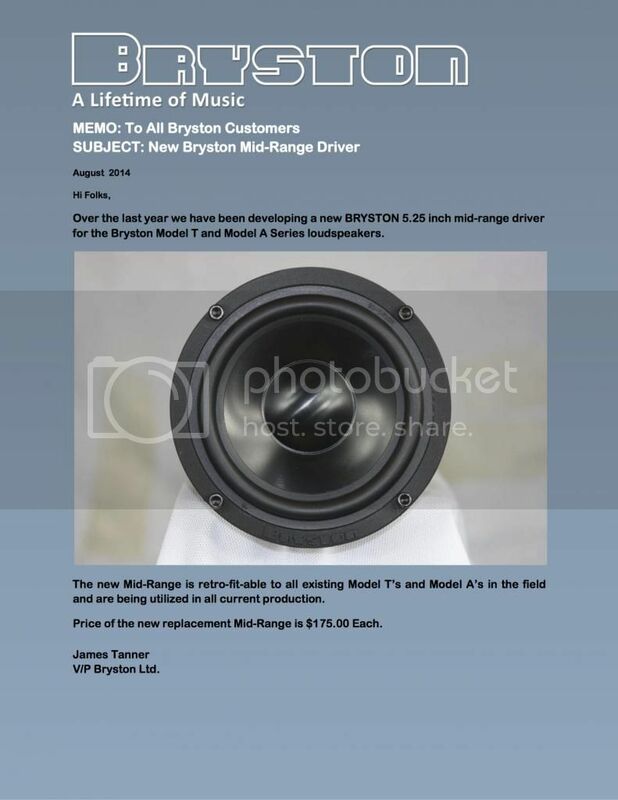 James clarified " ..on the earlier versions of the speakers we used the same midrange casting as Axiom. Currently we use our own casting..". Its nice to get a friendly response from him, he seems like a pretty good guy. I couldn't view it from my S4.